Fairfax County officials will help unveil a new outdoor soccer court at Southgate Community Center tomorrow afternoon. The community center at 12125 Pinecrest Road is scheduled to hold a ribbon-cutting ceremony to mark the opening of its new soccer area Tuesday at 4 p.m.
As Jennae Duarte of the county’s Neighborhood and Community Services explains, it was the kids that made it happen. Duarte said kids and teens in the area had been lobbying for more soccer facilities for some time when they came up with the idea of transforming an old, rarely used tennis court on the community center property into an outdoor soccer field. The teens spoke to members of the community center’s advisory council about the idea, and the council lobbied the county to help bring the idea into reality. Southgate also hosts an intramural soccer tournament each year, so Duarte said the new court will come in very handy for the annual event. Southgate Community Center was also the recipient of $3,500 worth of soccer equipment from professional team D.C. United as part of its “Every Save Makes a Difference” program earlier this year. D.C. United’s goalkeeper Bill Hamid scored seven saves during their July 1 match against Salt Lake, and each was worth $500 toward the organization of their choice. D.C. United’s donation included portable goals, nets, indoor and outdoor soccer balls, training equipment and more. The money for the equipment came from corporate sponsors such as MLS Works, Allstate and Univision Deportes. 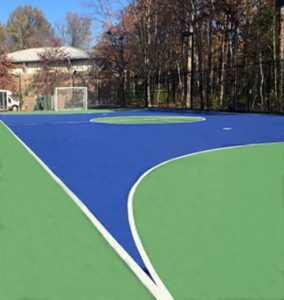 Now, kids in Reston have a brand-new court to try out that new equipment. In addition to Hunter Mill District Supervisor Catherine Hudgins and Duarte, many of the local kids who helped champion the idea of the new soccer field will be on hand to help cut the ribbon on Tuesday.